Helen and I went out today with NUKB to Wales. 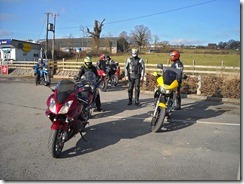 I led the rideout today with Debs doing TEC, leaving CJ free to take his action photos. 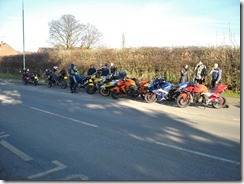 We started out from the Texaco garage near us were we picked up 4 other bikers. So 6 of us headed off from Heywood to Lymm Services to me the others. We just went via the motorway to save time and there’s no decent roads either. We met CJ, Ella and Wolfrunner at Lymm Services and some of us refuelled as well. 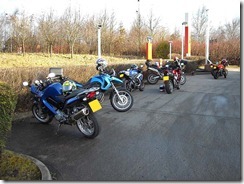 9 of us (including 3 lasses) set out from Lymm Services just after 9:30am and headed for Ponderosa Cafe for a brew. We set off for the A49 via the M56. We proceeded down the A49 through Tiverton then hung a right just after Spurstow and took the A534 to Wrexham. The roads were still a bit damp and muddy so we had to proceed with a bit of caution. We negotiated our way around Wrexham via the A5156 and A483. Just south of Wrexham we got off the A483 and took the A525 towards Ruthin. We cut out going through Bwlchgwyn by using the B5430 and rejoined the A525 further on. 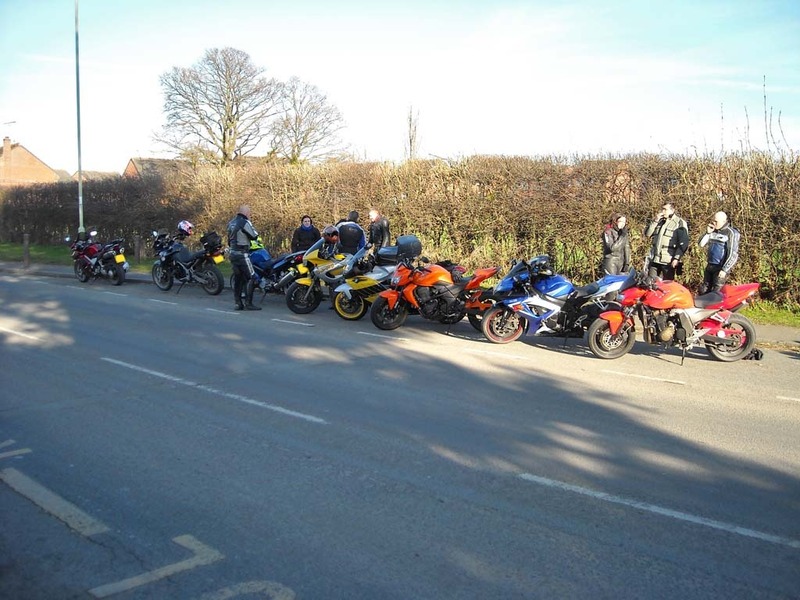 We then turned left down the A5104 and then left again at the next roundabout taking the A542 to Ponderosa Cafe. After some refreshments and a very nice scone. We carried on down the A542 and over Horseshoe Pass, the road was reasonably dry here so I had a decent go for it and waited at the bottom for the others to regroup. We then proceeded over the River Dee to the A5 (TomTom took a more scenic route over the river than had been planned on Autoroute, but it was a nice detour) and took that all the way to Oswestry. At Oswestry we took the A483 all the way down to Newtown through Welshpool. At Newtown we continued down the A483 and took the stunning 22 mile section all the way to Crossgates. We all had a great time on this road and got quite split up as we went at our own pace. 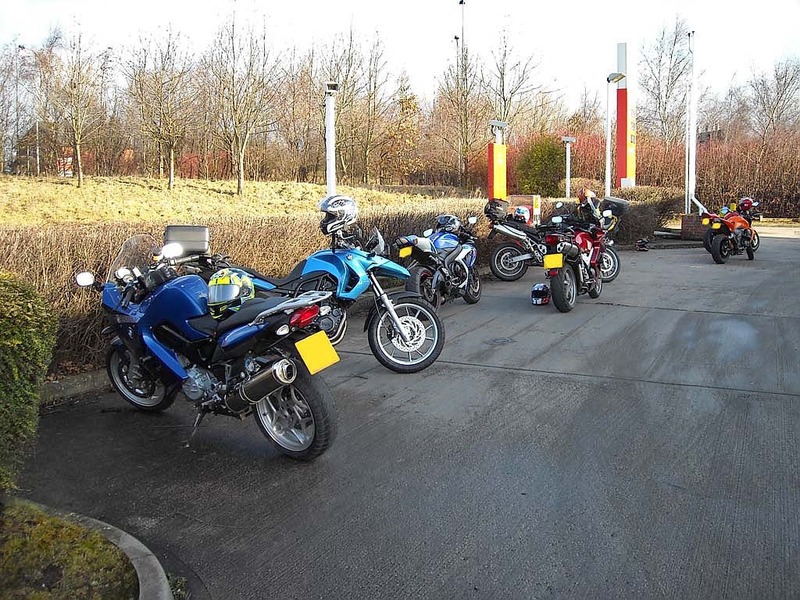 We all re-grouped outside Crossgates and then proceeded to the Cafe at Crossgates for some much needed lunch for us and fuel for the bikes. 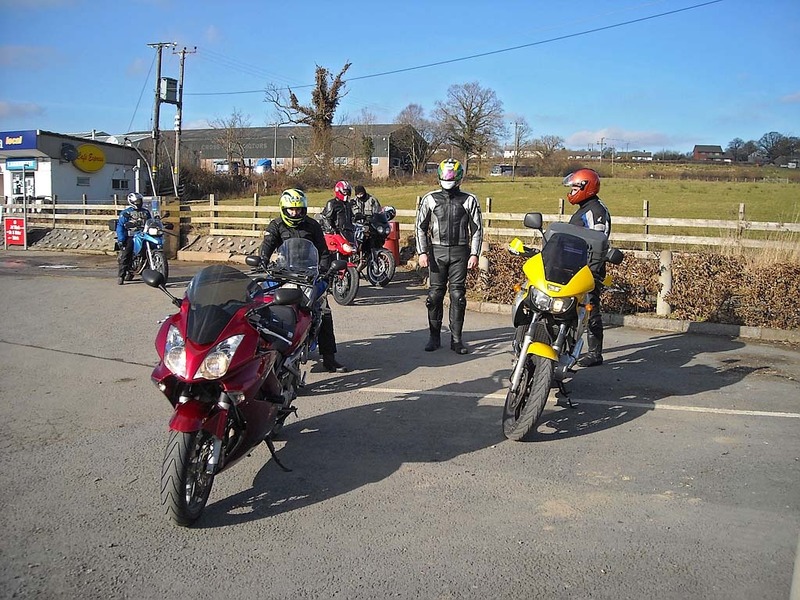 After lunch for us and the bikes we headed out of Crossgates up the A44, then turning left up the A488 at Penybont. We had a good run down this road but it was littered in places we mud. I then pulled over at Tref-Y-Clawdd as CJ had gone missing from behind. After a bit they all turned up and I found out CJ had stopped to observe the ladies form as they rode past, sorry take action shots. We then carried on along the A488 through Clun, were I spotted a really nice looking ruined Castle. We continued up the A488 through Bishops Castle and I stopped in a lay-by in Minsterley for everyone to re-group before we got to Shrewsbury. We soon arrived at Shrewsbury and used the A5 to get to the A49 to head back home towards Whitchurch. We then followed the A49 up to Whitchurch were we stopped so Helen could get some Super Unleaded and rest of us could have a comfort break. CJ and Ella left us here the rest of us proceeded up the A49 (Wolfrunner dropped off at Northwich to go to J&S) to the M56 and back home via the motorway.